You might not have heard of 3M, but you’ve certainly heard of its products. 3M makes Post-It Notes, as well as 55,000 other products covering a variety of needs. The multinational conglomerate has over 88,000 employees worldwide and has sold $30 bn in product last year. 3M was also ranked the 30th best company to work for by Business Insider. So why is it a top employer? We took a look and found out. Does the “20% rule” ring a bell? Google has a company wide policy where its employees are given 20% of their work time to work on their own projects. The logic behind it was that by letting employees discover things that they’re passionate about, they could find new products and work with Google on their new ideas. Many tech companies followed suit. While this innovative idea is chalked up to Google, 3M started doing this back in 1948. Dubbed the “15% rule” this was actually the policy that created the Post-It Note back in 1974. 50 billion Post-It Notes are produced every year now. This open work environment still exists to this day, and lets teams from all departments work together on new ideas. This openness extends to management too. Employees don’t notice drastic lines drawn between them and their superiors. Normally, their desks are within a common space shared with everyone else. 3M is proud of this open environment, but it does have its drawbacks. One of the main complaints that employees have is that the openness can slow down productivity. Everyone wants to pitch in for every idea, and one it’s out in the open it’s hard to take ownership again. Ideas sometimes get lost and never heard from again. 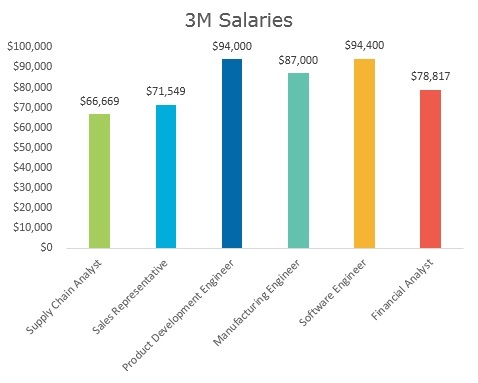 As a company with so many fields, your salary with 3M is going to vary widely based on what you do. Engineers and scientists make more on average than those in business, but don’t let that deter you – there are incentive programs for careers such as sales that’ll help you earn more. These benefits bring a lot to the table, and surveyed employees (both former and current) reported a 100% satisfaction rate with 3M’s benefits. The best way to get involved with any company is to intern with them. 3M offers plenty of recruiting opportunities, including at several colleges. 3M also has a case study competition every year, which looks great on any resume, but particularly if you’d like to work there in the future. The internship program we liked the most was the Frontline Sales Internship Program. If accepted, you’ll get trained by 3M’s salesforce and actually work on the sales team for the summer in one of five concentrations. You’ll get actual sales experience and make a ton of connections throughout the summer. Interns typically make around $20 an hour, and are provided food and housing stipends. Interested in other companies? Check out our articles on Procter & Gamble and Uber. Looking to take more stress out of the job search? TransparentCareer offers free data on compensation packages, salary negotiation, and career pathing. Sign up for a free account here!